General Insurance, also known as non-life insurance, comprises a range of insurance solutions that provide cover to the insured person against specific types of events. The difference between life insurance and non-life insurance is that while the former protects the insured against risks of death, the latter protects the insured against risks associated with life such as fire, burglary, illnesses, accidents, etc. A common area of neglect in young professionals is having adequate medical insurance. Many of these youth wonder why they need medical insurance and pay every year for it, even though they are healthy and rarely visit the doctor or the hospital. On the face of it, it may seem like a good idea to cut out medical insurance costs completely when you are healthy. However, this reasoning is seriously flawed. It is essential for everyone, young and old, to always have some form of medical insurance. The reason is that medical emergencies are expensive. Medical emergencies can occur even if you have been leading a healthy life and have no previous records of illnesses. If you land up facing a medical emergency without any insurance, it can cause a serious financial burden to fall upon you and your family and disrupt your longterm financial goals. One accident on the road or a sudden heart attack could cost you lakhs of rupees in medical bills. Emergency surgeries can also be very expensive. They may also result in the loss of income during your period of hospitalization and recovery. 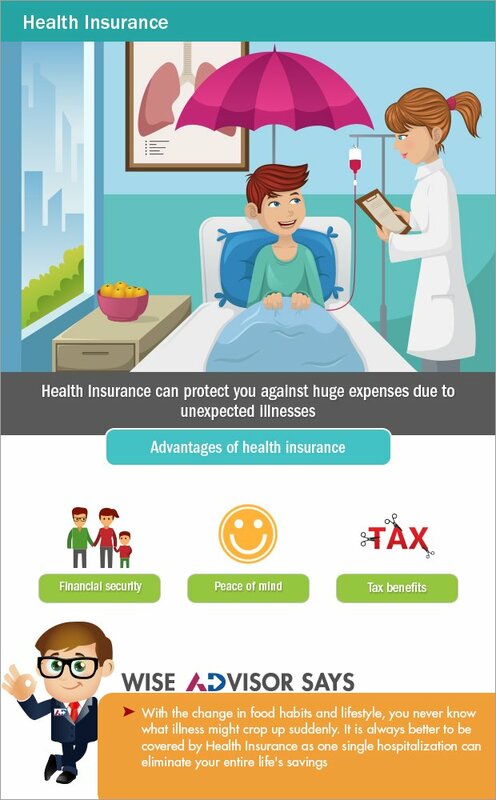 Additionally, if you are diagnosed with a serious medical condition, you may have extreme difficulty in finding medical insurance if you hadn't had it already. Health insurance is not a luxury; it is a necessity. Go for it when you are young. Increase your insurance cover as your income increases. It will help you in your youth and even after retirement. If you try to take medical insurance at a later stage of your life, the cost of insurance could get very expensive. Health insurance is not a luxury; it is a necessity. Go for it when you are young. Increase your insurance cover as your income increases. It will help you in your youth and even after retirement. 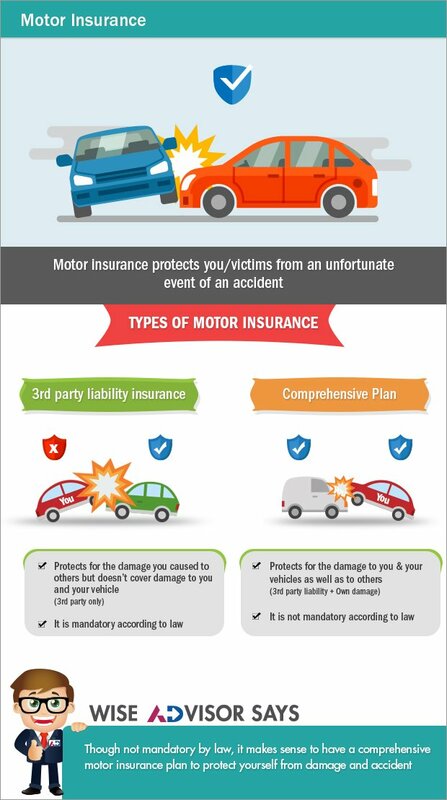 Motor Insurance protects financially against physical injury or damage to vehicles. Broadly Motor Insurance plans are of two types – Third party liability Insurance and Comprehensive plan. Third party liability Insurance plan doesn’t cover the policy holder but it protects the damage which the policy holder has caused to another person or his vehicle. On the other hand, comprehensive plan covers both the policy holder as well as third party against damage to vehicles and physical damage to both parties. Third party liability insurance is mandatory according to law but a comprehensive plan isn’t. However it makes good sense to take a comprehensive plan as it protects self also against damages. With increasing number of vehicles and increasing congestion coupled with bad roads and lack of traffic sense, accidents are day by day increasing in India. Thus having a comprehensive motor insurance plan protects you and your family from unexpected accidents. With increasing number of vehicles and increasing congestion coupled with bad roads and lack of traffic sense, accidents are day by day increasing in India. Thus having a comprehensive motor insurance plan protects you and your family from unexpected accidents. Going for a foreign trip and excited about the whole journey? You must have atleast once worried what would happen if you lose baggage, or trip gets delayed or get sick abroad. All such events could have huge financial impact as medical care costs overseas are very high and even delays or cancellations would mean your hotel and travel bills double. But you need not worry. Travel Insurance can cover against all these events. 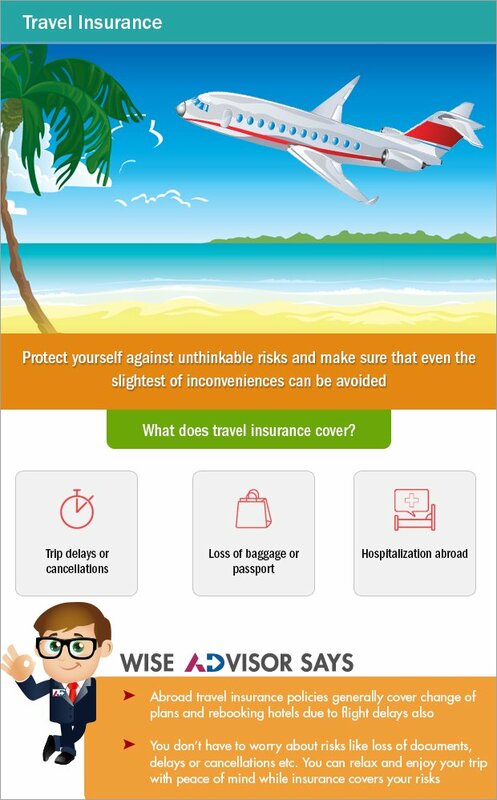 What all does a Travel Insurance policy cover? Even though you plan everything, there is always a risk that something could go wrong as a lot of things are not in your hands. To make sure that your journey is safe and enjoyable it is advisable to take a Travel Insurance policy. This way you can enjoy the trip while even slightest inconveniences are taken care of. Ensuring adequate insurance across life and non-life requirements is an extremely important part of holistic financial planning. Not having adequate insurance cover can severely jeopardize your financial goals. One uninsured hospitalization expense can throw back your dream home by a number of years. Insure yourself adequately from an early stage of your life and career, and sleep in peace.